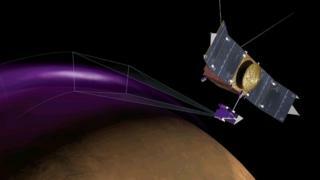 A Nasa spacecraft orbiting the Red Planet has detected a mysterious aurora that reaches deep into the Martian atmosphere. The Maven mission observed these "Christmas lights" for five days leading up to 25 December last year. Scientists have also discovered a dust cloud at high altitude, which does not match predictions. The preliminary results were presented at the 46th Lunar and Planetary Science Conference (LPSC) in Texas. The mission was designed to help solve the mystery of how the Red Planet lost most of its atmosphere and much of its water and other volatiles. "The question is how much water has been lost into the crust, how much has been lost to space. How much CO2 has been lost to the crust, how much to space," said Maven's chief scientist Prof Bruce Jakosky from the University of Colorado in Boulder. The bright ultraviolet auroral glow seen by Maven in December spanned Mars' northern hemisphere. Auroras, known on Earth as northern or southern lights, are caused by energetic particles such as electrons cascading into the atmosphere and causing the gas to glow. Although Martian auroras have been seen before by Europe's Mars Express spacecraft, what surprised scientists was how deep in the atmosphere this occurred - much deeper than at Earth or elsewhere on Mars. But the finding makes a degree of sense because while Earth retains a global protective magnetic field, Mars lost its one billions of years ago. This means that the high energy particles streaming in from the Sun make direct strikes, penetrating deep into the atmosphere. Maven also found dust surrounding Mars at altitudes of between 150km (93 miles) to 300km (190 miles) up. "This one was unexpected," said Prof Jakosky. Possible sources for the observed dust include material wafted up from the atmosphere; dust coming from Phobos and Deimos, the two moons of Mars; dust moving in the solar wind away from the Sun; or debris orbiting the Sun from comets. But how exactly the dust gets there is still unknown. "If the dust originates from the atmosphere, this suggests we are missing some fundamental process," said mission scientist Laila Andersson. The mission was launched in November 2013 and arrived in orbit around Mars in September last year.